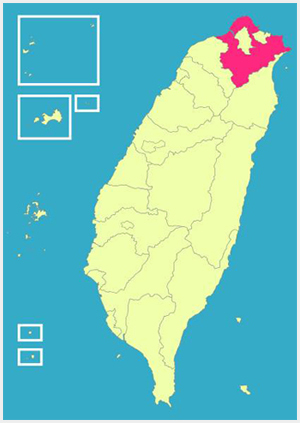 New Taipei City is a municipality located in the north of Taiwan. The administrative district of New Taipei City covers the northern tip of Taiwan and is the most populated municipality in Taiwan. New Taipei City surrounds Taipei City and is adjacent to [Geography picture of New Taipei City] Keelung City (northeast), Yilan County (southeast) and Taoyuan County (southwest). The easternmost tip of New Taipei City is Zilailai of Tianliaoyang, Gongliao District (coordinates 25° 00’ 00” N 122° 01’ 26” E); its westernmost tip is at Hsiafu of Hsiaonan Bay in Linkou District (coordinates 24° 40’ 05” N 121° 16’31”N); its southernmost tip is at Chilan Mountain of Wulai District (coordinates 24° 40’51” N 121° 29’ 29”E) and its northernmost tip is at Fukuei Cape of Shihmen District (coordinates 25° 18’ 11”N 121° 31’00”E). Surrounding Taipei City and adjacent to Keelung City on three sides, New Taipei City, Taipei City and Keelung City shape the Taipei Metropolitan Area and the three municipalities constitute a common living circle. The whole of New Taipei City covers an area of 2,052 km2 (which translates to approximately 6% of Taiwan proper’s total area) and its coastal line runs a distance of 120km. One can find a variety of topologies in New Taipei City such as mountains, hills, plains and basins. With the exception of the north coast (with several small rivers running into the ocean) and a small portion at the southeastern tip of the city that falls under Lanyang River region, the rest of the streams in New Taipei City are fresh water rivers including the Keelung River, Xindian River, Jingmei River, Beishi River, Nanshi River, Wenzi River, Sanxia River, Dahan River and so forth. The branches of these rivers form an intricately interwoven network of running water in New Taipei City and shape its wonderful geographical environs.